Often the assumption – without ever really defining it – is that safety culture vaguely involves employees who appreciate and participate in safe behavior. This kind of nebulous understanding doesn’t help anyone actively target problem areas of their aviation SMS' safety performance. Interpersonal relationships between employees to the bureaucratic, organizational structure of the SMS. The quality or level of safety culture in your aviation SMS will fluctuate as environmental factors change. To put it bluntly, safety culture is complex. Having a solid understanding of the reality and behavior-indicators of your safety environment becomes challenging. Safety professionals commonly find it difficult to maintain an objective perspective in evaluating the people and operations that they have spent many years working with. This phenomenon becomes less evident with safety professionals that are new to the organization, as their comfort level is not as high as a manager who has his blinders on and has lost the questioning attitude of "why do we do (you name the process) this way?" Objectivity is easier to maintain when the safety professional is not embedded tightly into the "team." I maintain that the Human Factor of Teamwork is intimately tied to safety culture and will without question impact an SMS' performance dramatically. Aviation safety management systems that excel universally puts their people first and support team dynamics. What Are Safety Culture Services? 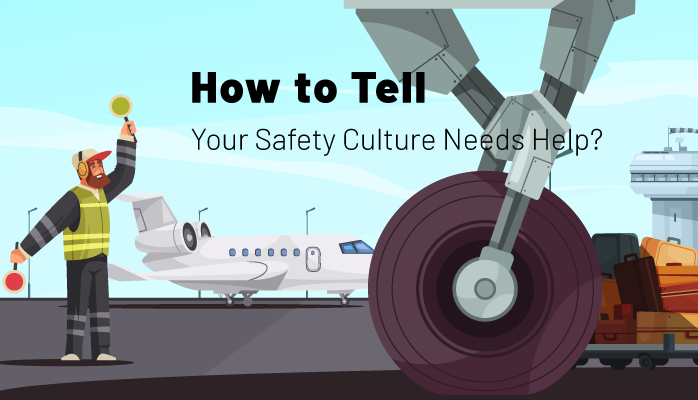 Implement strategies that improve safety culture in an effort to set safety culture as your aviation SMS' Norm. Safety culture services are necessarily customized to each organization. Data gathering involves quantitative and qualitative analysis of current safety culture behavior, dynamics, and trends. Understanding safety culture involves piecing that data together to portray what root attitudes, behavior, and relationships are influencing your organization, for better and worse. Strategies for implementing safety culture mainly involve overhauling your safety promotion efforts through resources and direct guidance. General inspection of historical safety behavior and current trends. The list goes on, but the tools are designed to gain an comprehensive understanding of each moving part that both positively and negativelyinfluences your organization’s safety culture. How do I know when I need guidance? One of the easiest ways to start tracking safety culture data and give yourself a baseline to see “what you are working with” is through safety surveys. These safety surveys would have questions that can each be scored, such as with a 1, 2, or 3 (higher is better). The same safety culture survey can be given out at regular intervals – such as every six months or annually – to every employee, and the average safety score of employees can be charted over time. If your safety culture surveys contain multiple categories, such as categories for safety behavior, safety attitude, etc., you will also be able to track average scores over time for various aspects of safety culture. We have seen this employed to great effect. Beyond simply gathering safety culture data for yourself, these surveys send the message that safety behavior and attitude are being observed and tracked, and give impetus to employees to “pay attention” to safety. Number of safety promotion campaigns within past three months and six months. The purpose of taking baseline measurements is to compare existing SMS performance to future SMS performance. However, we must ensure that system inputs that affect our chosen metrics are accounted for. For example, if you take a safety culture survey followed up by multiple safety promotion campaigns, how do you account for subsequent changes in SMS performance? Which safety promotion campaign affected performance? Do You Need Safety Culture Services? Does your safety culture really suffer? What is your safety reporting rate? Ideally, your monthly safety reporting metrics should approach approximately ten safety reports per one-hundred employees. Before running off "to save the world" with your safety promotion activities, first review your safety policy statement and your non-punitive reporting policy. Do these important policy documents resonate with employees? When employees don't believe your safety polices or there are reasons to doubt management's sincerity, then you will be wasting your time. Well-written safety policies should be written in language that all employees can understand and believe. Do you have an easy way for employees to submit safety issues? Safety tools affect safety culture. When your safety reporting tools are not user-friendly, employees are certain to avoid repeating bad experiences. They may report one safety issue, but when they think about the pain of submitting the first safety report, you can be assured they will not voluntarily report another safety concern. Safety reporting forms should be short and to the point. If it takes an employee more than two minutes to submit a safety report, then you should consider reducing the friction. Well-designed safety reporting forms are designed for the reporter, and not to capture every possible variable in existence merely for the convenience of the safety team. Where to Find Safety Culture Services? In the meantime, do you need help with safety surveys? Below are some templates you can use in your SMS.